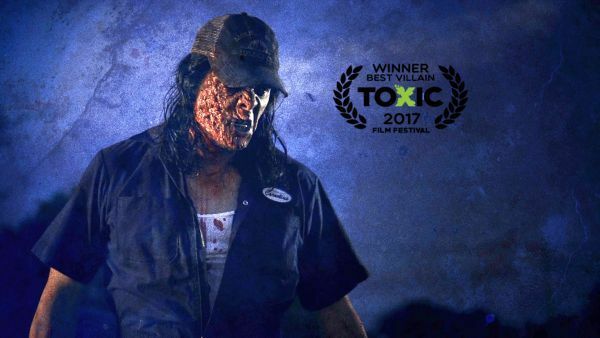 Back in June 2017, the nominees for the TOXIC FILM FESTIVAL TOXFF Awards were announced. Both NIGHT OF SOMETHING STRANGE and SHE KILLS were up for several awards-including my role as Cornelius in the Best Villain Award category. Today, the results were posted. She Kills won awards for Goriest Film, Best Poster Art, Craziest Cinematic Death & Best Femme Fatale (Jennie Russo). NoSS picked up awards in Best Feature, Best Practical FX (Colby Flinchum) and….Best Villain (Woo Hoo!) 🙂 Congrats to all the winners. I can finally have one of those logo thingies on my pic 🙂 This will be my second acting award-the first for Best Villain for my role as Tybalt in ROMEO 3000 (MAD ANGEL FILMS in association with WWJ PRODUCTIONS). This entry was posted in HONORS / AWARDS and tagged Awards, Best Feature, Best femme Fatale, Best Poster Art, Best Practical FX, Best Villain, Colby Flinchum, comedy, Cornelius, Craziest Cinematic Death, evil dead, gore, Goriest Film, Honors, horror, horror film, horror movie, jennie russo, jonathan straiton, mad angel films, night of something strange, Romeo 3000, RON BONK, SHE KILLS, STDs, TOXFF, Toxic Film Festival, wayne w johnson, WWJ, WWJ Productions, zombies. Bookmark the permalink.